The Russian Salmon Association has helped secure a new international agreement that will protect up to 50,000 trophy fish – and its President Gennady Zharkov says other groups can learn from its strategy of reaching out to decision makers. Russia’s stock of Atlantic salmon, which has been under serious threat from over-fishing, has been given important new safeguards thanks to an historic inter-government deal between Russia and Norway. The agreement is being celebrated in Russia as a major victory for the recreational fishing industry as it will protect up to 50,000 trophy fish in one of the world’s most popular salmon fishing destinations, the Kola Peninsula. The groundbreaking agreement restricts the fishing activities of the Sami people of northern Norway, who regularly catch and kill the Atlantic salmon on their migration routes around northern Norway. It is a deal that has been made possible thanks to pressure from the Russian Salmon Association, whose President Gennady Zharkov (pictured right) is also a member of the EFTTA Board. Zharkov says that what he has learned about building alliances and putting pressure on policy makers can inspire other conservation groups around the world in their efforts to protect fisheries – as he explains here in this exclusive interview. 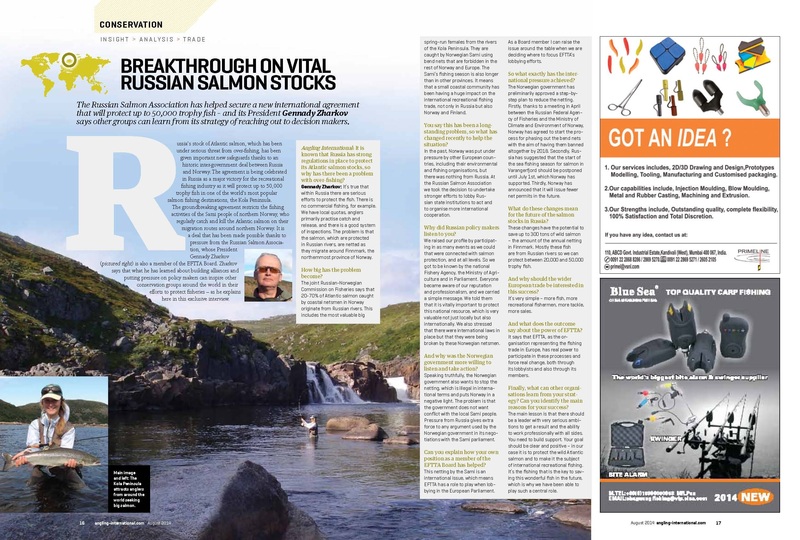 Angling International: It is known that Russia has strong regulations in place to protect its Atlantic salmon stocks, so why has there been a problem with over-fishing? Gennady Zharkov: It’s true that within Russia there are serious efforts to protect the fish. There is no commercial fishing, for example. We have local quotas, anglers primarily practise catch and release, and there is a good system of inspections. The problem is that the salmon, which are protected in Russian rivers, are netted as they migrate around Finnmark, the northernmost province of Norway. How big has the problem become? The joint Russian-Norwegian Commission on Fisheries says that 20-70% of Atlantic salmon caught by coastal netsmen in Norway originate from Russian rivers. This includes the most valuable big spring-run females from the rivers of the Kola Peninsula. They are caught by Norwegian Sami using bend nets that are forbidden in the rest of Norway and Europe. The Sami’s fishing season is also longer than in other provinces. It means that a small coastal community has been having a huge impact on the international recreational fishing trade, not only in Russia but also Norway and Finland. You say this has been a longstanding problem, so what has changed recently to help the situation? In the past, Norway was put under pressure by other European countries, including their environmental and fishing organisations, but there was nothing from Russia. At the Russian Salmon Association we took the decision to undertake stronger efforts to lobby Russian state institutions to act and to organise more international cooperation. Why did Russian policy makers listen to you? We raised our profile by participating in as many events as we could that were connected with salmon protection, and at all levels. So we got to be known by the national Fishery Agency, the Ministry of Agriculture and in Parliament. Everyone became aware of our reputation and professionalism, and we carried a simple message. We told them that it is vitally important to protect this national resource, which is very valuable not just locally but also internationally. We also stressed that there were international laws in place but that they were being broken by these Norwegian netsmen. And why was the Norwegian government more willing to listen and take action? Speaking truthfully, the Norwegian government also wants to stop the netting, which is illegal in international terms and puts Norway in a negative light. The problem is that the government does not want conflict with the local Sami people. Pressure from Russia gives extra force to any argument used by the Norwegian government in its negotiations with the Sami parliament. Can you explain how your own position as a member of the EFTTA Board has helped? This netting by the Sami is an international issue, which means EFTTA has a role to play when lobbying in the European Parliament. As a Board member I can raise the issue around the table when we are deciding where to focus EFTTA’s lobbying efforts. So what exactly has the international pressure achieved? The Norwegian government has preliminarily approved a step-bystep plan to reduce the netting. Firstly, thanks to a meeting in April between the Russian Federal Agency of Fisheries and the Ministry of Climate and Environment of Norway, Norway has agreed to start the process for phasing out the bend nets with the aim of having them banned altogether by 2018. Secondly, Russia has suggested that the start of the sea fishing season for salmon in Varangerfjord should be postponed until July 1st, which Norway has supported. Thirdly, Norway has announced that it will issue fewer net permits in the future. What do these changes mean for the future of the salmon stocks in Russia? These changes have the potential to save up to 300 tons of wild salmon – the amount of the annual netting in Finnmark. Mostly these fish are from Russian rivers so we can protect between 20,000 and 50,000 trophy fish. And why should the wider European trade be interested in this success? It’s very simple – more fish, more recreational fishermen, more tackle, more sales. And what does the outcome say about the power of EFTTA? It says that EFTTA, as the organisation representing the fishing trade in Europe, has real power to participate in these processes and force real change, both through its lobbyists and also through its members. Finally, what can other organisations learn from your strategy? Can you identify the main reasons for your success? The main lesson is that there should be a leader with very serious ambitions to get a result and the ability to work professionally with all sides. You need to build support. Your goal should be clear and positive – in our case it is to protect the wild Atlantic salmon and to make it the subject of international recreational fishing. It’s the fishing that is the key to saving this wonderful fish in the future, which is why we have been able to play such a central role.